NYCDailyDeals -- What's Free And Cheap In New York City Today: NYC Daily Deals Anniversary BBQ This Sunday! Raffle Prizes Revealed! 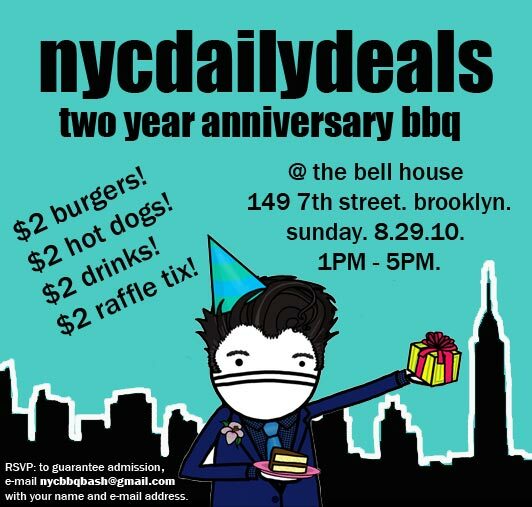 NYC Daily Deals Anniversary BBQ This Sunday! Raffle Prizes Revealed! 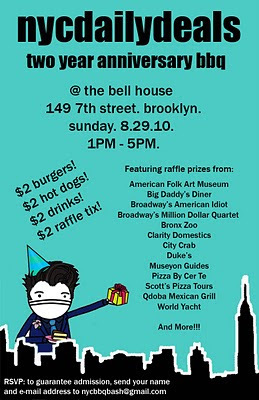 As you may have heard, we're throwing a little birthday party this Sunday afternoon. 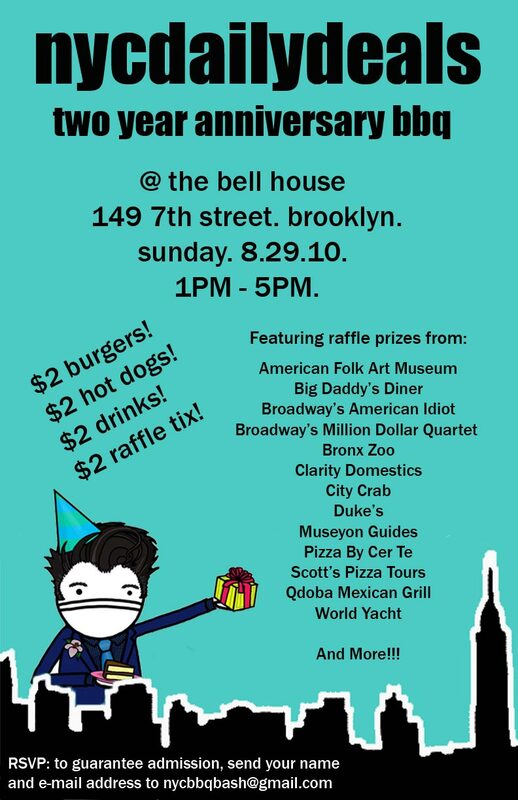 It's at The Bell House in Brooklyn... and we’ll be grilling up $2.00 burgers and hot dogs. Select drafts and well drinks will be just $2.00 too! You can find all the details here. Remember to send your name and e-mail address to nycbbqbash@gmail.com to guarantee admission. 1) Single raffle tickets will cost $2.00 each. Or you can get 10 tickets for $10.00! 2) The first 100 people to purchase at least $10.00 worth of tickets will get a gift -- you'll be able to choose between either (1) a coupon for a free entree at Qdoba Mexican Grill or (2) a limited edition NYC Daily Deals "Happy Hour" magnet. 3) The raffle will take place at 4:30PM. You do not need to be present to win. All winners will be contacted via e-mail. American Folk Art Museum - One Year Membership! American Idiot - Two Tickets To This Broadway Hit! Big Daddy's Diner - $50 Gift Certificate! Bronx Zoo - Four Pairs Of Free Passes! City Crab - $50 Gift Certificate! Clarity Domestics - Free 3-Hour Housecleaning! Duke's - $50 Gift Certificate! Million Dollar Quartet - Two Tickets To This Broadway Hit! Museyon Guides - Two copies of City Style & Chronicles Of Old New York! Pizza By Cer Te - Two $25 Gift Certificates! Scott's Pizza Tours - Two Free Tour Passes! World Yacht - Two Tickets For A Free Dinner Cruise!